1995 Tucson Mountains - Map and Trail Guide for Tucson Mountain Park and Saguaro National Park, West. Tucson: Arizona-Sonora Desert Museum Press. 1998 Southern Arizona Trails Resource Guide. Tucson: Pima Trails Association and Pima County Parks and Recreation Department. 1997 Tucson Hiking Guide. Boulder, CO: Pruett Publishing Company. 33 trails located in the mountain ranges surrounding Tucson are described. Topographic maps, and background information about the areas are included. 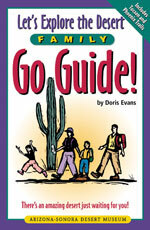 1998 Best Hikes with Children in Arizona. Seattle: The Mountaineers. Descriptions of 50 trails throughout Arizona suitable for family hikes. 1998 Southern Arizona Trails. Berkeley: Wilderness Press. Includes 84 trails ranging from short day hikes to overnight backpacking treks and is a guide for the beginner as well as the experienced hiker.